Paddy McCarthy was originally from England, a former soldier he moved to Ballymurphy in 1970 to take up a job with the Ballymurphy Tenants’ Association (BTA). The people of Ballymurphy had a great respect for him, he was treated as a true friend, they saw Paddy as someone who understood them. Paddy worked hard to help his neighbours, setting up youth clubs and organising activities for the children of the area. Following the introduction of internment without trial a curfew was imposed in Ballymurphy. This prevented essential bread and milk vans from entering the area. Knowing full well that local families were dependent on these deliveries, Paddy tried to help. He attempted to get a ceasefire order from the commanding officer of the Parachute Regiment to enable the children of the area to be evacuated. He stepped out with a Red Cross flag tied to a broomstick, the flag was shot out of his hand, and he began to bleed profusely. When he returned to the BTA Paddy commented that ‘even the Jerry’s respected that flag’. Still he was determined to try his best for the people of Ballymurphy and while still bleeding heavily he loaded milk into crates and onto a trolley. Paddy started to walk through the streets calling out ‘milk for babies’. On his journey he was told by two members of the Parachute Regiment to get back. The soliders harassed and threatened him, one of them fired a shot over his head. Eyewitnesses watched in horror as the stress of the events became too much for Paddy and he suffered a fatal heart attack. The Andersonstown News met with Paddy’s 81-year-old sister Sheila Burch, who was on her first ever visit to Ireland last week. While she was on this emotional visit, Sheila was shown around Ballymurphy. She also attended the Ballymurphy Massacre March for Truth and spent some time attending lectures and exhibitions in St Mary’s University in relation to the Ballymurphy Massacre. She also had a private visit with Father Des Wilson. As we sat in Springhill House Sheila recalled: “My father Eric was a socialist and left wing and was really into political activity. In the 1920’s he was very much impressed with and wanting to be part of the Irish situation. 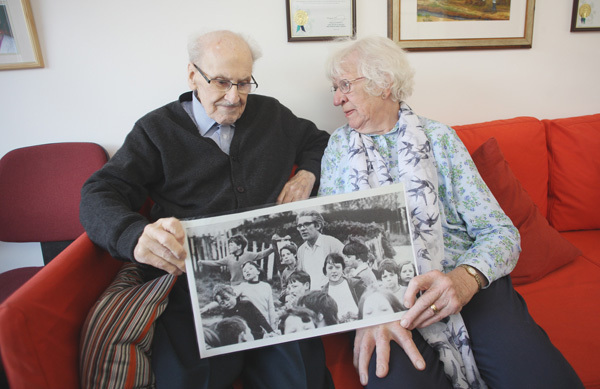 “He called himself Eric Patrick McCarthy, so when Pat was born in 1926 his birth was registered as Padraig Diarmuid McCarthy, a few years later my sister was born and the family had reverted to the name Camp, which was Eric’s proper name. Pat and Maureen went on to have three children Jenny, Susan and Robert. Pat spent a few years working as a youth leader in England. In 1970 following the breakdown of his marriage to Maureen, Pat answered a job advertisement for a youth worker with the Ballymurphy Tenants’ Association. Discussing Paddy’s move to Belfast Sheila said: “He worked in Notting Hill for three or four years, the charity he was working for decided it was time to call it a day and closed down. He then worked in the East End for a while, while working there he had a heart attack and was in hospital for a while. “It was around that time he realised what was going on in Belfast and it was the kind of situation he wanted to do something about. He saw the advertisement for a community worker, he applied and was interviewed. His marriage had broken down and he was with Jan at this stage. Sheila continued: “I know that Pat was very involved with the community here, he was extremely concerned about the children. He told me he was horrified at what was going on, he said the loyalist areas had been clearing out and making life hell for the Catholic people. “He said when he first got here it had been a fairly mixed community and people had got on with each other more or less. Then suddenly new housing was going up and all of the Protestants were being offered these houses while the Catholic people were being threatened and burnt out (of their homes). “He said they were in a refugee sort of status. He was very concerned, not only about the community but particularly the youngsters. There was no work, nothing for them to do, they were being caught up in the sectarian stuff and then of course internment came in. Describing the lead up to Pat’s death Sheila said: “Again, the Paratroopers were bombarding the place and Pat was trying to get a ceasefire with the commanding officer. “There was no milk or bread for the babies, he managed to get some and he went out on to the street calling ‘milk for babies’ he was stopped by the Paras. The night before he died Pat rang his sister. “I asked him how he was doing and he said ‘I’m alright’. I asked him if he was happy and he said he was very happy. I said, ‘I know you, make sure you take care of yourself as well, and do the impossible, keep your head down and your chin up’. “So that was on the tenth (of August) then on the eleventh I got a phone call and I cannot for the life of me remember who it was from, it might have been Jan but I can’t remember. “They said, ‘I’m sorry to tell you but Pat’s had a heart attack and he’s been taken to the Royal Victoria Hospital. I rang the hospital and asked to be put through to the cardiac ward. “I asked if my brother had been admitted, they said ‘there’s no one here called Pat McCarthy, have you tried the mortuary?’ I was furious, I said, ‘what do you mean?’ and they said ‘well he’s had a heart attack, he’s probably dead.’ And that’s how I was told. Sheila continued: “Then I had to let my mother know, and, again, to this day I cannot remember how I did that, she didn’t have a phone, so either I or my husband drove from Hertfordshire to central London to tell her. Of course, she immediately wanted to go to Ballymurphy. We had very little money but we managed to scrape together her fare to Belfast. Describing her mother, Sheila said: “Our mother, Joan (Camp) was also well known in Ballymurphy. She came over to Belfast on several occasions, after Pat died. She took up the reigns, she bombarded just about everybody there was with letters. She was a Labour member, a socialist all her life, she was an excellent letter writer. After Pat’s death Sheila lost touch with his children for a while. However that is no longer the case. “Thanks to the Ballymurphy Massacre campaign we found each other again. “I didn’t even know anything was going on here, I thought it was done and it was gone and then I saw a full page advert in The Guardian from the Pat Finucane Centre. I looked down this huge list of names and there was Pat.